The village  of Kinderhook lies within the township  of the same name. Albany International Airport, 737 Albany-Shaker Rd, Albany, . Close, but not very international. Stewart International Airport, 1180 First St, New Windsor, +1 845 564-2100, . An alternative to Albany, but at present offers few direct flights to major destinations. 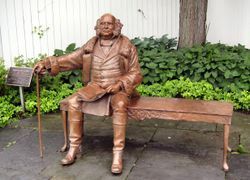 Martin Van Buren National Historic Site, 1013 Old Post Rd (off Route 9H), +1 518 758-9689, . Lindenwald is the retirement home of the 8th president. Van Buren was the first US president born after the nation's independence and to date the only Dutch speaking president. House is open for guided tours daily from Memorial Day weekend through the end of October; Saturday and Sunday, November through the first week of December. Grounds open year round dawn to dusk. Visitor center open 9AM to 4:30PM on dates the mansion is open. Columbia County Museum, 5 Albany Ave, +1 518 758-9265, . Columbia County Historical Society holds and displays collections from the surrounding area, has extensive research library. This page was last edited on 20 August 2010, at 03:08.